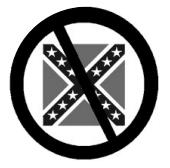 No to the Confederate Flag! No to racist provocations! The appearance of the Confederate Flag in Nova Scotia is a disturbing and odious phenomenon. combat white supremacy in Nova Scotia.